from 3 pcs. 2,65 EUR ea. from 10 pcs. 2,31 EUR ea. from 20 pcs. 2,15 EUR ea. from 40 pcs. 2,00 EUR ea. 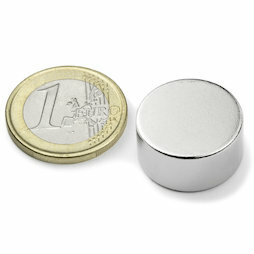 With this disc magnet you're definitely getting the most magnet power per euro! Wow! And that at a very good price. No wonder it's one of our magnet bestsellers: We already sold more than 1,5 million of it! We think the expression "Wow" should be used sparingly - but sometimes it just has to be said. 1 pc. 4,34 EUR ea. 1 pc. 2,93 EUR ea. 1 pc. 15,16 EUR ea. 1 pc. 8,62 EUR ea. 1 pc. 7,61 EUR ea. 1 pc. 3,64 EUR ea. 1 pc. 2,68 EUR ea. 1 pc. 2,69 EUR ea. 1 pc. 93,68 EUR ea. This disc magnet is especially suitable for making your own knife racks. Of course it's totally useless - but if you needed to attach a pile of 50 sheets of A4 paper (80g/m2) to a metal cabinet - you could. Uster - 21:00- And my magnet is still holding! The disc magnet S-20-10-N (20x10 mm) can hold approximately 1,75 kg in shear direction, then the steel plate starts sliding down. If you place a rubber tape between magnet and steel plate, the disc magnet can hold approximately 5,2 kg in shear force; then it starts to slide down. With a self-adhesive silicone disc between magnet and steel plate (invisible because it has the same diameter as the disc and is only 0,5 mm thin) the disc magnet can hold over 5 kg in shear direction; then it starts to slide down. You just can't stop poking the ring!